As the most populated city in Australia, Sydney faces some of the most intense noise pollution challenges across the nation. The ever-growing urban sprawl is constantly pushing residential communities closer to major arterial roads and commercial/industrial regions, with lot sizes shrinking and residential boundaries getting tighter. Today, more than ever, we’re seeing that people expect more from their fence; and we’re ready to exceed those expectations. Our acoustic fencing and residential noise barriers deliver a 20dB – 25dB noise reduction, effortlessly reducing audible noise fourfold. The sleek finish of the panels offer a premium rendered look, whilst the various post sizes can mirror the dimensions of a standard fence, to a grand brick wall with piers. Due to its simple post and panel system, installation is quick, easy and only a quarter of the install time of rendered brick. They can be installed DIY, or we can put you in touch with our nationwide network of Trade Partners who can expertly quote and install your fence for you. The lightweight materials are perfect for restricted site access or installation over underground services, whilst our integrated retaining features offer a seamless fencing solution for sloping blocks. With the option to integrate lighting, letterboxes, slats, infills and more, never before has one fence held so much potential. Whether its privacy, noise reduction, premium aesthetics or ease of installation you’re looking for, ModularWalls’ acoustically rated fencing and wall systems are designed specifically for the modern backyards of Sydney; it’s time to expect more from your fence. From Penrith, to the Hills District, to the Sutherland Shire, our range of wall and fencing products can be supplied DIY or installed by one of our trusted Trade Partners. Our Head Office, Manufacturing Plant and brand new Show Room is located at 2a Clerke Place, Kurnell, and is open between 8.00am to 4.30pm, where our friendly staff are always happy to show you around and talk you through our products. Our Trade Partner network extends to a number of the larger regional cities, including Newcastle and Wollongong. We also supply materials to the furthest corners of New South Wales, and our systems can easily be installed DIY or by any local fencer, landscaper or builder. Give us a call on 1300 556 957 or enquire online to discuss how we can best provide the right solution for your needs, no matter where you call home. 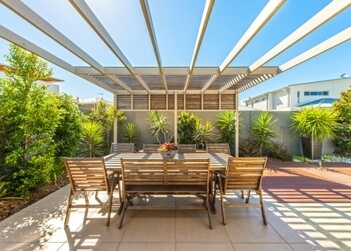 When every centimetre counts, make every single one beautiful and functional with our SlimWall modular fencing, just like this local Cronulla home. A newly renovated home chose sleek SlimWall for the boundary fence surrounding their meditation garden, to harmonise with the modern architecture of their home. 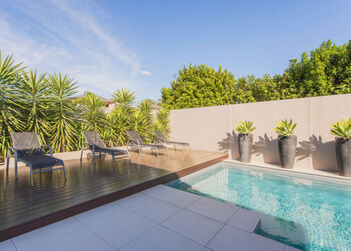 Our premium EstateWall boundary wall served as the perfect backdrop to frame this stunning, coastal-style backyard transformation, including a gorgeous new pool area. Get Started on your Sydney project today! As the most populated city in Australia, Sydney faces some of the most intense noise pollution challenges across the nation. The ever-growing urban sprawl is constantly pushing residential communities closer to major arterial roads and commercial/industrial regions, with lot sizes shrinking and residential boundaries getting tighter. Today, more than ever, we’re seeing a dramatic increase in effective noise attenuation solutions; and we’re ready to meet those market demands. From community development wall and fencing solutions, to road compliant noise barriers, to revolutionary sound absorbing wall panels, our noise attenuation wall products are designed for the heightened demands of today’s noise pollution challenges. For landscaping requirements, our commercial retaining wall solutions can be used as standalone structures or seamlessly integrated within boundary or noise barrier systems. With the option to integrate lighting, letterboxes, slats, infills and more, never before has one wall system offered so much potential. Our premium aesthetics deliver a graceful solution that traditional concrete simply cannot match. The modular nature of the systems ensure a rapid, simple install process, whilst the lightweight materials are the perfect solution for restricted site access or easements across public services. Our revolutionary processes and products also provide up to 80% reduction in embodied and emitted carbon project-wide, supporting enviro-friendly and carbon efficient construction practices. ModularWalls is here to support your project at every stage of the development; from initial design, to manufacture and supply, to installation support, we can offer turnkey solutions for your project. As we manufacture everything locally, in Kurnell, NSW, we have control of the entire supply chain, ensuring rapid supply and a unique level of quality control and customisation. 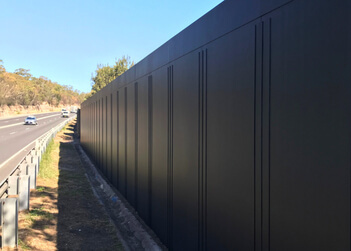 From Penrith, to the Hills District, to the Sutherland Shire, we have become a trusted market leader of acoustic wall and fencing solutions. In the heart of Sydney, our AcoustiSorb panels have been used for projects within the Opera House, Harbour Bridge and Town Hall, to name a few. Our Head Office, Manufacturing Plant and brand new Show Room is located at 2a Clerke Place, Kurnell, and is open between 8.00am to 4.30pm, where our team are always happy to meet with you and discuss your project’s unique requirements. We have completed projects in the furthest corners of New South Wales, in some of the harshest climates and conditions that Australia can throw at us. Give us a call on 1300 556 957 or enquire online to discuss how we can best provide the right solution for your project. 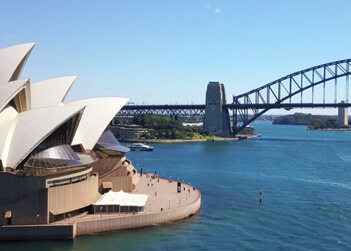 ModularWalls' revolutionary AcoustiSorb sound absorption panels were chosen for projects within two of the most iconic landmarks in Sydney...simultaneously. 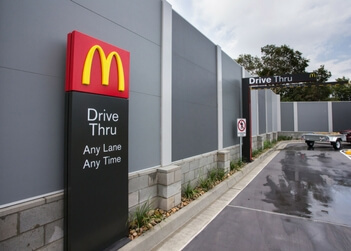 McDonald’s at Sandgate required an acoustic wall to serve the dual purpose of sound attenuation from the bordering train line, as well as visual security. ModularWalls was engaged by The Roads and Maritime Services to remove and replace a 30m section of collapsed concrete road barrier along Alfords Point Rd.